A narrow road dappled with sunlight winds through a forest, past a cottage where a family is begging for money at the gate. A traveler with a backpack and stick rests in the shade at the path's edge, while in the distance a woman wearing a broad hat carries two buckets on a yoke. The traditional title of the drawing refers to a path in the Haagse Bos, a large forest around The Hague in the Netherlands. 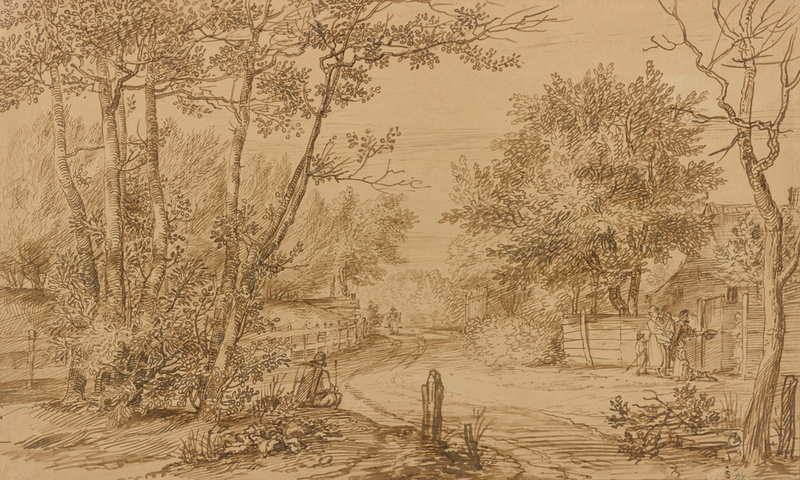 Although Jan Lievens produced this and most of his landscape drawings in the studio, he still managed to capture many minute details: the varied textures of leaves in sunlight, trees with delicate hatching on their trunks, and careful shading on the path to show the sunlight and shadows. Lievens used a rare and costly sheet of Japanese paper for this drawing. The slightly iridescent surface of the paper gives the composition an added warmth and rich sheen. Japanese paper was quite hard to find in the Netherlands during the 1600s, and the only other artist who used it often was Rembrandt, a friend and former colleague of Lievens. Probably John Spencer, British, 1708 - 1746 (Althorp, Northampton, UK), probably by descent to his son, John Spencer. Or John Spencer, first earl Spencer, 1734 - 1783, probably by descent to his son, George John Spencer. Ernst Goldschmidt, Belgian, 1887 - 1954 (Brussels, Belgium), by inheritance to his heirs. T. Philipe, London. Catalogue of a superb cabinet of drawings. June 10, 1811, p. 50, lot 445. George Jones, London. Geniune Collection of Original Drawings: A Catalogue of a genuine and select collection of very fine original drawings. March 2, 1819, p. 11, lot 149. ]. April 27-29, 1937, p. 36, lot 341, ill.
Schneider, Hans. Jan Lievens: sein Leben und seine Werken (Amsterdam: B.M. Israel, 1973), p. 390, no. SZ. 432, fig. 58 (illustration incorrectly numbered as fig. 57). Sumowski, Werner. Drawings of the Rembrandt School, Walter L. Strauss ed. 10 vols. (New York: Abaris Books, 1983), vol. 7 (1983), p. 3740, no. 1679x, no. 4. Ader Tajan, Paris. Collection de Dessins Anciens réalisée par un amateur belge dans les années 30. October 28, 1994, unpaginated, lot 38, ill.
Sotheby's, New York. Old Master Drawings. January 23, 2001, pp. 42-43, lot 140, ill.
Wheelock, Arthur K., Jr., et al., eds. Jan Lievens: A Dutch Master Rediscovered, exh. cat. (Washington, D.C.: National Gallery of Art, with Yale University Press, 2008), p. 261, no. 121, ill, entry by Gregory Rubinstein. Rubinstein, Gregory. "Brief Encounter: The Early Drawings of Jan Lievens and Their Relationship with Those of Rembrandt." Master Drawings 49, no. 3 (2011), pp 368-370, fig. 36, note 44.